Gaskins Co., Inc. Valve Selection Considerations | Gaskins Co., Inc.
CONSOLIDATED offers a broad range of pressure relief valve solutions, providing reliable protection for plant personnel and equipment. CONSOLIDATED achieves this goal by offering the most efficient solution for any specific pressure relief valve application. 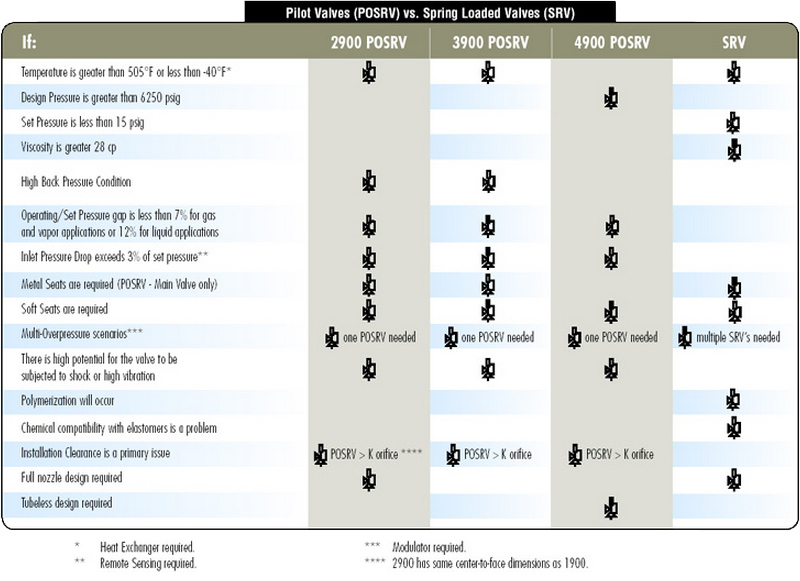 In general, most situations can be handled with either a pilot operated or a spring-loaded valve design. CONSOLIDATED offers both of these alternative solutions using world-class designs, and offering unparalleled application expertise and support. The following chart provides some basic guidelines on selecting the right solution for your application. Please consult with your local CONSOLIDATED sales office or local distributor to select the best and most economical solutions for your specific pressure relief applications.